18 Things a 21st Century Teacher SHOULD Do and HOW To Do Them! DO you know what an IFTTT recipe is? What about how to App Smash something? The technology available at our fingertips is mind blowing, but all too often, we aren’t even close to using it to its capacity. As a teacher, I have seen my fellow colleagues beat their heads against a wall (metaphorically speaking) as they attempt to hold back the tide of technology as students try to help it wash into the classroom. What are we so afraid of? Surely it’s well and truly time to get ahead of the game and teach our students that their phones and tablets can be used for more than game playing and social media. We are in the 21st century and we need to recognise that these devices can actually make our lives easier! We already know that students want to be using their devices, they also like the curiosity challenge, so we should be using this to our advantage. Before you know it, the kids will be on-task and with less behaviour management issues to deal with when we can make activities interactive & interesting. 1. Post a question of the week on your class blog. If you don’t already have a class blog, you should seriously consider it. Here’s a link which guides you through 15 blog sites you could use and explains the pros and cons of each. If you’re not sure what happens on blogs, here’s a link to some forward-thinking 21st century teachers with successful classroom blogs so you can get some ideas for what to include in your blog. This strategy is a great way to have your students own what happens in your classroom and hone their literacy skills! Happy blogging! 2. Participate in a Twitter chat. Whether you are a tweet-a-holic or are still trying to understand what a #hashtag means, this link explains 50 ways you can use Twitter in the classroom. If you don’t even know how to get to Twitter, here is a helpful video that will guide you through where to find it and how to get started. 3. Make a parody of a hit song. A personal favourite of mine is Autorap, an iPhone app that lets you speak into the phone and automatically converts it into rap song and puts it to music! One of my year eight students showed me this app and it certainly changed how we do revision now. Sometimes the words are difficult to hear, so I like to make a quick movie to the soundtrack. Here is a link to an example, in which I used My Talking Pet, Windows Movie Maker and Autorap #AppSmash. 4. Create an infographic as a review. Visual cues help us store and access information which increases the chances that your students will remember what you’ve taught them. If you’re not the creative type, you can use a free template, or make your own using PowerPoint. Infographics are a must for the 21st century teacher. In Australia, we use 2.4 million tonnes of paper each year. How much paper does your organisation use? Here are 15 tips for going paperless in your school. 6. Create your own class #hashtag. This 21st century teacher strategy allows Twitter to categorise your tweets so they are all grouped together and easier to find. Here’s a quick link to get you started. 7. Integrate selfies into your curriculum. Show me a student who doesn’t like a good ol’ selfie and you’ve just found yourself an alien (or perhaps an undercover police officer). Using this strategy personalizes the learning and makes it more memorable. I utilised this strategy when my year 12 Science in Practice class had an assessment piece making a user guide for the equipment in our Performing Arts Centre. The photos they used needed to be authentic and recognisable as them using the equipment. It worked so well and really made sure they knew how to use the equipment rather than getting a random pic from Google. All you need for this one is a smartphone, iPod with camera capabilities, or if you go old-school…a camera. 8. Curate a class Pinterest account. Using Pinterest with students allows them to collaborate with others to curate information. Critical thinking skills come in play when students locate, analyse, and select quality information for a board answering an essential question for a research project. 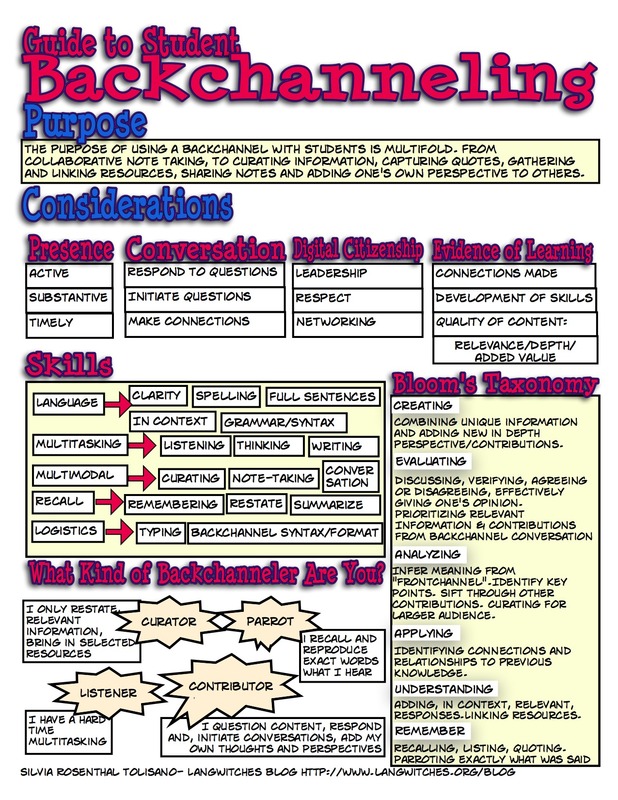 Check out this guide for uses, project ideas and a rubric for assessment! It’s what the cool kids do! What is it? Content created in one app transferred to and enhanced by a second app and sometimes a third. Preferably the final product is then published to the web–remember, digital presence is the new résumé (CV). Here’s how to smash it up! Note: #2 uses App Smashing technology…look at you go already! Combine the real world and computer-generated realities for an interactive and mind-blowing lesson. You will surely look like a ninja with this strategy. Warning: your students are quite likely to be engaged…are you ok with that? 11. Create an IFTTT recipe. What the heck is that? IFTTT (abbreviation of “If This Then That” and pronounced like “gift” without the “g”) is a web-based service which allows other services (e.g., Gmail, Google Reader, Instagram, Craigslist) to be programmed by means of simple conditional statements (called “recipes”). This strategy essentially packages everything that you are interested in and allows for some automation which is time saving! Here’s how to use it. 12. Perform in a lip dub video. Perhaps we’ll see this strategy in the 21st century school camps. It’s touted as a fun and unique way to bring your team together and learn how to work together. In the very least, it does look like fun! With so many templates out there, making an ebook for your class work is definitely impressive. In Australia, ebooks represent about 10 percent of the market (Slattery, 2013). This means that the market has a long way to grow and teaching students this skill now could help develop a passive income strand before they are even out of high school. Flex your 21st century teacher muscles and use an app, or just make it in PowerPoint or Microsoft Word and save it as a PDF–it’s that easy! Snappy is also a great resource to use, when you click on it, it looks a little boring, but download the program and it’s super easy to use! 14. Produce a class audio podcast. State of the News Media (2011) estimated there were 2,231 education podcasts produced. This is not many when you consider that Apple put the total number of podcasts at around 250,000. This 21st century teacher skill is a great way for students to show depth of understanding as well as to learn digitally relevant skills that could easily have them as the next Steve Jobs, before they even graduate. Here are some ways to get into podcasting. How many times a day do you tell your students to put their phones away during their lesson? What if there was a way to harness that interest and propensity for conversation and tie it into your lesson? There is and it’s been around for a little while now; it’s called a Backchannel. While this sounds awesome, you need to put some constraints around it or your lesson will be lost forever. I learned this the hard way, in true ‘crash and burn’ style but I can tell you that it certainly is the fastest way to learn. I would definitely use it again with implementing some strategies before starting. Comics are the perfect way to help engage learners in reading and getting them to use their imaginations (something we seem to train out of our kids as they get older). These can be used to show understanding for a concept, practice active problem solving, improve writing skills and even help students understand body language cues. You don’t need to be super computer literate, but this 21st century teaching strategy is so easy to implement. 17. Take a photo of class work. Technology is here to stay and the quicker you harness its benefits, the easier your job will be. Use your mobile phone to record the work covered during the lesson and then upload it to your class blackboard/Moodle/internet page. This way if students are away, they can easily catch up on the work covered. For more ideas, read 21 Things Every 21st Century Teacher Should Do This Year.